CURVE, Pa. - The Pittsburgh Pirates have set the 25-man roster that will open the 2014 campaign with the Double-A Altoona Curve ahead of the scheduled season opener with Erie on Thursday at 6:30 p.m. Altoona will open the season with 12 pitchers and 13 position players. Of the 25 players on the roster, 13 have suited up in a Curve uniform in prior seasons. Headlining the Opening Day roster for the Curve are SS Alen Hanson and RHP Nick Kingham, who both rank among the top six prospects in the Pirates organization according to Baseball America and both spent time with the Curve in 2013. Kingham, who checks in as the fifth-best prospect in the system and No. 64 in all of MiLB according to Baseball America, was superb for the Curve in 2013, going 3-3 with a 2.70 ERA in 14 games (12 starts). Hanson, who is right behind Kingham as the sixth-best prospect in the system according to Baseball America as well as the 67th-best prospect according to MLB.com and No. 76 in MiLB according to Baseball America, played in 92 games with Bradenton and hit .281 with seven homers and 24 steals before a late-season promotion to Altoona. In 35 games at the end of the season with the Curve, Hanson hit .255 with four doubles, five triples and six steals. Of the 12 pitchers heading to Curve, Pa. as a part of the Opening Day roster, five spent time with the Curve in 2013. RHP Ryan Beckman (15 games), LHP Zack Dodson (one game), RHP Kenn Kasparek (38 games), Kingham (14 games) and LHP Jhonathan Ramos (36 games) all pitched with the Curve last season. Joining the returnees will be RHP Matt Benedict, RHP Emmanuel de Leon, RHP Joan Montero, RHP A.J. Morris, LHP Joely Rodriguez, RHP Tyler Sample and RHP Adrian Sampson. Rodriguez was added to the Pirates' 40-man roster this offseason and enters 2014 as the 30th-best prospect in the system according to Baseball America. Sampson, who spent all of 2013 in Bradenton (25 games, 24 starts), is also a starter and enters this season as the 27th-best prospect in the chain according to Baseball America. Morris and Sample will be in their first season in the Pirates organization after being acquired in the Minor League phase of last year's Rule 5 draft. Altoona's infield will see many returning faces with Kelson Brown, Jarek Cunningham, Hanson, Justin Howard, Drew Maggi, Gift Ngoepe and Andy Vasquez all returning. The infield will see some shuffling though with Cunningham moving to third base and Ngoepe (No. 29 according to Baseball America) playing primarily at second base. Cunningham led the team last season with a career-high 19 homers while Howard hit a solid .314 in 98 games during his first season at the Double-A level. In the outfield, the Curve will see Mel Rojas, Jr. return to patrol centerfield after a solid showing during 2013 with the Curve. Rojas, Jr. batted .274 in 120 games and .295 after May 15. He'll be joined in the outfield with newcomers Keon Broxton, who was acquired in a trade with the Arizona Diamondbacks on Thursday, Willy Garcia, who played the entire 2013 season with Bradenton, and Junior Sosa, who was with both West Virginia and Bradenton in 2013. Broxton, a former third-round pick in 2009, spent all of 2013 with Double-A Mobile in the Southern League before heading down under to play for the Sydney Blue Sox in the ABL this past offseason. Garcia, who checks in as the Pirates' 14th-best prospect according to Baseball America, hit 16 home runs to lead the Bradenton Marauders in 2013. He also is listed by the same publication as having the "Best Outfield Arm" in the system after showing it off in 2013 with 20 outfield assists (led both the Florida State League and the Pirates organization). Starting the season behind the dish for the Curve will be catchers Elias Diaz and Ralph Henriquez. Diaz, 23, played in 57 games for the Marauders last season (55 behind the dish) and batted .279 with 12 doubles. Henriquez, 26, played in 79 games for the Long Island Ducks of the Independent Atlantic League in 2013. He last played in affiliated ball in 2012 when he spent time in Jackson (AA, Southern League) and Tacoma (AAA, Pacific Coast League) while playing in the Seattle organization. 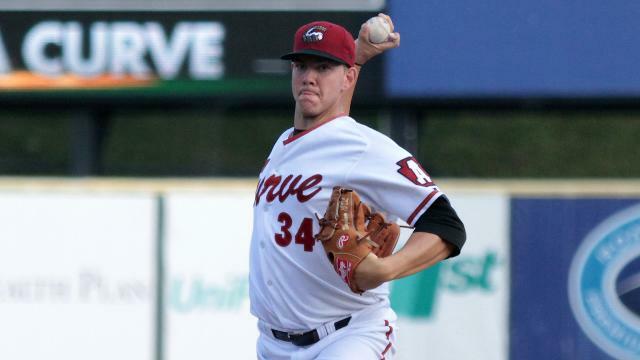 The first opportunity to see the 2014 Altoona Curve in action will be at 6:30 p.m. Thursday night when they host the Erie SeaWolves (AA - Tigers) at Peoples Natural Gas Field to start the 16th season of baseball in Curve, Pa. The first 5,000 fans into the game on Thursday will take home a 2014 Magnet Schedule courtesy of Premier Services of PA. Following the game, all fans can enjoy the first postgame fireworks show of the season. In addition, Thursday also serves as the first Thirsty ThursdayTM of the season with $2 16oz. Yuengling drafts and $2 22oz. sodas on special thanks to Rocky 104.9. Members of the Silver Steamers Club presented by Homewood at Martinsburg can enjoy their first game of the season on Thursday night as well. For tickets and more information, call 877.99.CURVE, visit AltoonaCurve.com or stop by the box office windows at Peoples Natural Gas Field. Join the Curve conversation on facebook (facebook.com/AltoonaCurveBaseball), Twitter (@AltoonaCurve) and Instagram (@AltoonaCurve).